Is it pronounced Wilkes-BEAR or Wilkes-BAR? 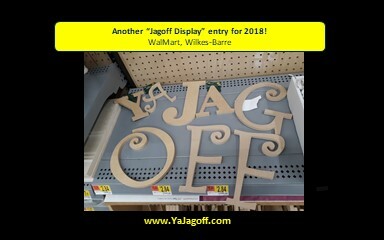 Either way, we have another wonderful jagoff display.. yes.. from Wilkes-Barre (however you pronounce it.) We completely love the creativity in this one. It looks like it took some time, standing in the WalMart, to arrange everything so nicely.. maybe even taking a moment to stand back and stare at it like a famous artist and then make a tweak or two. Bottom line.. this was no rush job and, quite honestly, it brings a tear to the eye. It’s quite a touching piece of art. Stunning! It might be THE ONE! Keep them coming! We will go until the end of the week and then we will vote for a prize next week for the best one! Thanks B. Wolfe for the pic! !